At Issue in J-Town: Where to Draw the Line? You are at:Home»English»At Issue in J-Town: Where to Draw the Line? The Los Angeles Department of City Planning held a public hearing last month on the Little Tokyo Community Design Overlay (CDO) District, which creates development guidelines and standards that reflect the community’s vision for the area. The original guidelines were first formulated by the now-defunct Community Redevelopment Agency of Los Angeles about ten years ago when many developments were being proposed for the Little Tokyo area. After CRA/LA initiated a plan to protect Little Tokyo’s unique cultural character with the help of the community, City Planning has incorporated this sentiment into a new plan, which has been under development since 2008. Approximately 40 stakeholders and community members from the Little Tokyo area, Arts District, Central Industrial District, and Skid Row neighborhood gathered at the hearing held at the Japanese American Cultural and Community Center. Most of them applauded the plan that will protect the Little Tokyo’s culture and history while also improving the neighborhood by implementing wider sidewalks and making the neighborhood pedestrian-friendly. However, adopting the CDO zone map that City Planning proposed was a different story. According to the proposed map, the Little Tokyo CDO area is bounded by Temple Street to the north, Alameda Street to the east, Third Street to the south, and Los Angeles Street to the west. He agreed with the city’s attempt to do the CDO, but added, “Religious institutions are the soul of the culture and important for the Japanese community and culture. We provide space for all sorts of Japanese cultural activities.” Rev. Rumme also pointed out that the temple is included in the Little Tokyo Business Improvement District map. Eric Kurimura of Nishi Hon-gwanji Los Angeles also asked City Planning to revise the map. “Because these religious institutions have held services in downtown for over 100 years, the community has been able to maintain a cultural presence here,” he said. Mike Okamoto, chair of the Little Tokyo Community Council, expressed his support for the plan itself, but asked City Planning to revisit some of the historical linkages so that zoning would include institutions that have been vital to the community’s heritage. On the other hand, residents from the Arts District asked that the proposed map remain as is. Jonathan Jerald, a nonprofit art gallery operator in the Arts District, acknowledged the religious institutions are part of what Little Tokyo is all about, and he respects what they do. However, he also asked for the line to remain drawn at Alameda. “Our primary concern is that CDO, which restricts and requires certain design elements on particular site, could affect future development in our community,” he said. Representatives from the Central Industrial District and the Skid Row neighborhood are asking the south side of Third Street, where the majority of buildings are retail and industrial, to be removed from the CDO zone map since the guidelines inappropriately characterize that particular area. Estela Lopez, executive director of the Central City East Association, which represents the Arts District BID and the downtown industrial BID, pointed out that after an initial outreach in 2010 and 2011, the Arts and Industrial District BID were excluded from the process. “We conveyed our opposition and we heard nothing back,” she said. Lopez emphasized, “We embrace our traditions in the Arts District too. Blank walls are canvases for art. Mechanical equipment and roll-down doors are not necessarily undesirable.” She also said that these guidelines inappropriately characterize the retail stores on the south side of Third Street. 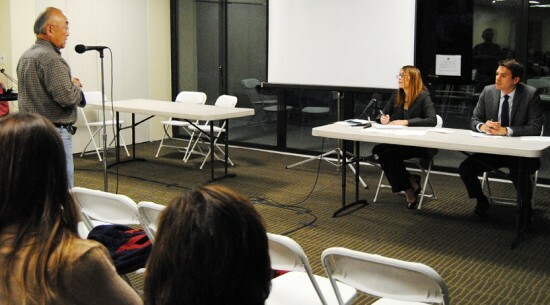 She remarked that informal conversation had begun between the Little Tokyo community and Central City East Association over the zoning map and urged City Planning not to finalize the plan until it is informed of the results of this conversation.